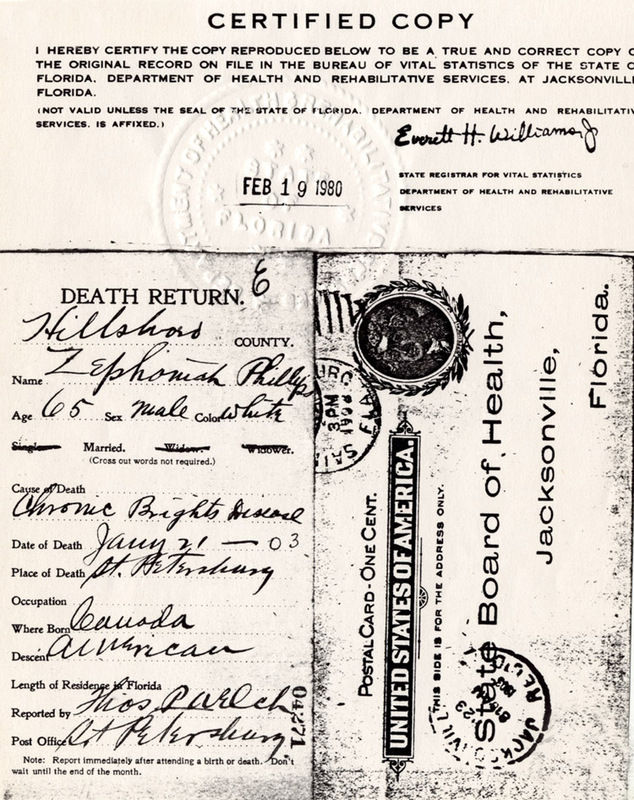 Zephaniah Phillips died 21 January 1903 in St. Petersburg, Florida. He was 65. Cause of death was chronic Bright's Disease, which was inflammation of the blood vessels in the kidneys. According to the ceath certificate he was born in Canada but was of American descent. Nothing is known of his mother, nor why he was born in Canada. In different sources his place of birth is listed as Lincoln, Canada, Toronto, Canada, and St. Clair County, Canada. Lincoln is on the southwest side of Lake Ontario, south of Toronto and west of Niagara Falls. There is no St. Clair County in Ontario, but there is an area called St. Clair at the southern tip of Lake Huron, on the Canadian side of the St. Clair River. Zephaniah's wife, Mary, survived him by many years, dying in 1929. They are both buried in the Greenwood Cemetery in St. Petersburg.